Boone Central/Newman Grove seemed to spin its wheels a bit early before hitting the gas and finding traction in Friday night’s high school football season opener in Albion. Trailing 7-0 late in the first quarter, BC/NG found high gear and ripped off 42 straight points by the end of the third period, finishing with a dominant 42-20 win over the Pierce Bluejays. Senior quarterback Dylan Gentrup steered the victory for the Cardinals, totaling 271 yards, rushing for three touchdowns, and passing for two scores. Pierce took the lead on its second possession of the game, finishing off a nine-play, 82-yard drive with Dalton Freeman’s 14-yard touchdown pass to Devan Roth. After sputtering on its first possession, Boone Central/Newman Grove answered after the Bluejay score. Gentrup hooked up with Will Frey for a 13-yard gain and the Cards’ initial first down, and later found the junior tight end for an 18-yard gain. Gentrup added a 29-yard dash during the drive, then scored BC/NG’s first touchdown of 2017 on a 10-yard gallop with 1:48 to play in the opening quarter. Frey tied the score with the PAT. From there, it was all Cardinals. Gentrup fired a four-yard TD strike to Cody Nelson with 8:34 remaining in the second period, then gave Boone Central/Newman Grove a 21-7 halftime lead with a zig-zagging highlight-reel 15-yard scamper 2:44 before halftime. BC/NG was forced to punt on the first possession of the second half, but the Big Red defense forced a Freeman fumble on the ensuing play, recovered by Frey at the Pierce 24-yard line. 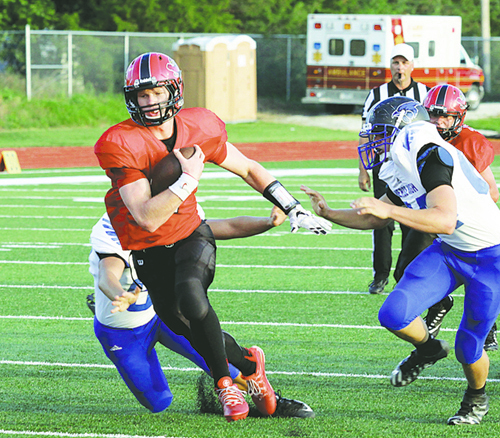 Levi Krueger burst 21 yards on first down and, three plays later, Gentrup scored on a five-yard run. BC/NG’s defense rose again, foiling a fourth-down pass attempt by Freeman, and Gentrup concluded an eight-play scoring drive with a 30-yard pass to Frey, who outfought a pair of Pierce defenders, eventually grabbing the tipped ball with one hand. Less than two minutes later, Krueger raced 56 yards to put Boone Central/Newman Grove ahead 42-7. Pierce tallied two fourth-period touchdowns against Cardinal reserves, but was never in a position to threaten.